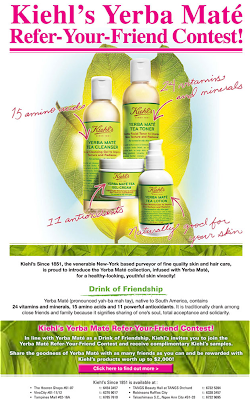 Kiehl's In Singapore: Join the Kiehl's Yerba Mate Refer-Your-Friend Contest! Join the Kiehl's Yerba Mate Refer-Your-Friend Contest! Join the Kiehl's Yerba Mate Refer-Your-Friend Contest and win up to $2000 worth of Kiehl's product! Sign up for free as a member at cozycot.com and start to refer your friend to win!